Synonyms: Brachylepis nervosa Wight & Arn. 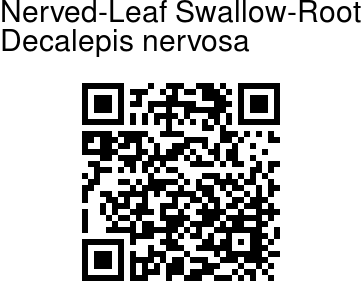 Nerved-Leaf Swallow-Root is a climbing shrub, with stem purplish, velvet-hairy; latex milky. Leaves are simple opposite, 5-10 x 3-7 cm, elliptic or elliptic-oblong, pointed to tapering, base blunt, upper surface hairless and shining; lateral nerves 8-10 pairs, prominent below, opurplish in young leaves; leaf-stalk to 1 cm long. Flowers are borne in leaf-axils and at branch-ends, in condensed cymes. Flower-cluster-stalk is velvet-hairy or becoming hairless. Calyx is deeply lobed, sepals ovate, pointed. Flower are pinwheel shaped, petals ovate greenish-purple; corona of 5 broad membranous scales. Stamens 5, attached to the throat of flower; filaments short. Ovary hairless; style tip capitate. Follicles narrowly lanceshaped, 6-7 cm long. 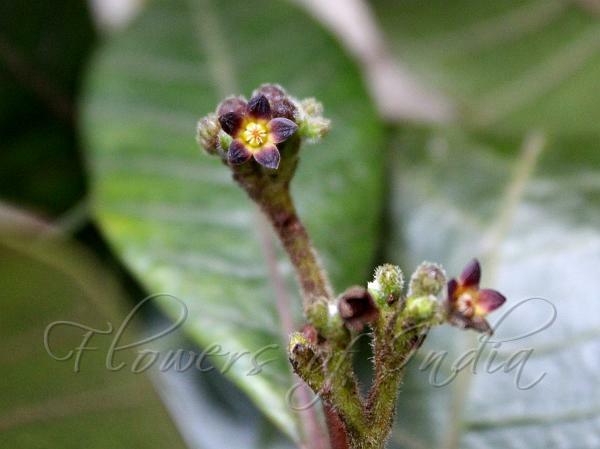 Nerved-Leaf Swallow-Root is endemic to Western Ghats Flowering: September-April. Medicinal uses: Root is used as pickles, indigestion and substitute of Nannari plant for health drink. Identification credit: M. Saradha Photographed in Nilgiris Biosphere Reserve, Tamil Nadu.